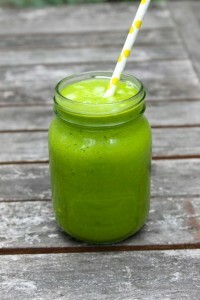 I love that vibrant green colour of the Melon & Spinach Smoothie. It makes me feel instantaneously happy and I know it makes my body happy too. I’ve been drinking loads of smoothies lately in an attempt to boost my immune system and this one makes a refreshing change as it has no banana. The texture is similar to juice and feels lighter than the banana based smoothies but is nevertheless delicious and sweet. I usually have it as a mid afternoon snack but it can be enjoy at anytime: it does make a great breakfast. Spinach will provide a good amount of iron which will be absorbed more easily with the orange thanks to its vitamin C content. Melons are high in water and will keep you hydrated as well as providing some Vitamin C, potassium and vitamin B-6 ( helps regulate mood and sleep). I often add wheatgrass powder to my green smoothies which helps with cleansing and detoxing, but that’s completely optional (it’s on the pricey side!). 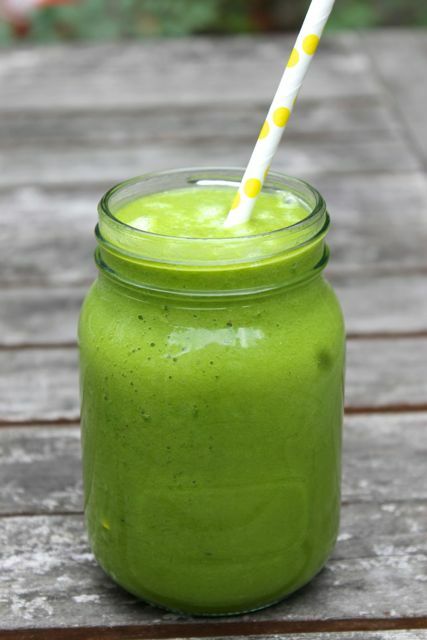 Put all the ingredients in your blender and blend until smooth. This entry was posted in Breakfast, Smoothies, Vegan, Vegetarian. ← Vietnamese Nems Salad and Fresh spring rolls: 2 recipes in 1! Hi. Thank you so much for featuring my smoothie on your list.